Welcome to the Envirogroup page. There are 7 enthusiastic members from Years 5-8 in our group- Rosie, Alex, Rosa, Max, Kaelyn, Hendrix and Edward. We have group meetings when we need them and we talk and plan. We all applied to join the envirogroup because we want to help the community and the environment. Mrs Anderson is our amazing lead teacher and helps us organise our thoughts and plans. One of the first projects we did was to set up a vegetable garden in 2014. In 2015 Room 2 planted the gardens and we harvested potatoes and cooked them to make hot chips. We also had strawberries, peas and silverbeet. We made peppermint tea and sold mint cuttings at Pet Day. Edward’s dad gave us big tractor tyres that we also used for potatoes. The flower seeds we planted didn’t work though. We won a worm farm with worms in 2015. We put food scrap buckets in the classrooms to collect fruit to feed them and this year we will take out the compost from the worm farm to put on the garden. Room 3 studied worms and put posters in the classrooms to remind us what foods the worms will eat. 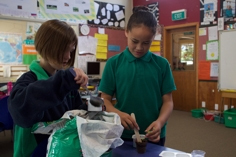 2015 hui at Gore – we learned how to make seed balls and how to graft apple trees. We also made plant pots from recycled materials. Other school groups showed us projects that they’d been working on and it was a great way to network with other Enviroschools in the Southland. Whole school recycling learning in 2015. Jen from Waste Net came to do a whole school audit with us and we saved our rubbish for a week then weighed and sorted it. The categories were 39% organic that can be composted; 20%was paper that can be recycled; 15% was plastics; 20% was rubbish for the landfill and 6%was items that might be reusable. 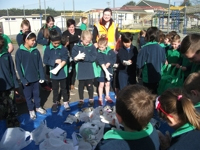 Tour of Waste Visit - Invercargill. 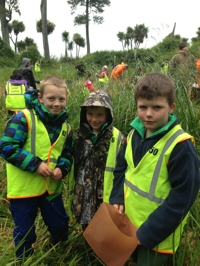 The whole school went on this outing and we visited the old Invercargill landfill at the Estuary, the Garage recycling centre at the landfill and the Dis Ability centre where everyone helped sort the city’s recycling collection bins. We were very intrigued to see what happens to our rubbish. The seniors investigated setting up our own compost bin at school and Room 2 created some recycled tile art to tie in with this learning. Mrs Kennedy and Mrs Pool also taught us how to knit things from strips of recycled plastic shopping bags. Room 1 had their own Wearable Arts show and made some amazing outfits. Planting hundreds of native seedlings at the Donut in early 2016 was combined with signing up to be an Enviroschool – “it was a massive opportunity for us” said the group. 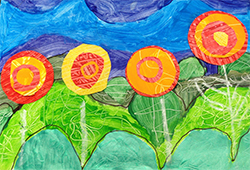 Rosie’s speech at the signing ceremony describes the Donut for us – “Eight years ago Heddon Bush became involved in preserving this small patch of podocarp forest that once covered vast areas of the Southland Plains. This was a school project inspired by a donation from the Masonic Lodge of Winton and was affectionately nicknamed ‘The Donut’. It was then protected by a QE11 covenant by the owners at the time, the Horner family, who also initially fenced off the Donut back in 1986 to protect it from stock damage. Over the last 8 years the school have continued to plant, spray and weed with lots of support from the current owners Abe & Anita de Wolde, Environment Southland, QE11 Trust, SERN group, the teachers and community. We intend to have whole school planting days at least twice annually and the senior class are currently investigating pests at the Donut. They will put out traps to see which animals live there. This is an important heritage area and a long term community project. Our Southland Community Nursery visit in early 2016 inspired us when we collected and learned about native seeds. We are now going to set up our own native nursery at the back of the school. We have hundreds of seeds planted and wait patiently for them to grow and will then plant the trees in the Donut when they are big enough. Another long term project! Environment Southland Community Environment Award 2016 – we were highly commended for this award for our work at the Donut and received a plaque and more plants to add to the site. This was a massive achievement made even more special when we received $500 from the winner of another category – Ernslaw 1 Ltd – who donated their winning prize money to our schools section. That was so kind of them and the funds will help set up our native nursery. Recently the Envirogroup helped Ken and Julie Dykes build a beautiful stone sculpture for the garden – like a water feature without the water!